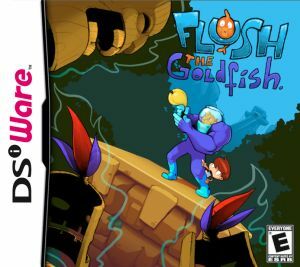 The DSiWare service continues to serve as a home for independent developers with innovative ideas, and Flipper 2: Flush the Goldfish is another example of that creative spirit. A sequel in name only to Flipper, this latest creation from Goodbye Galaxy Games is full of surprises. 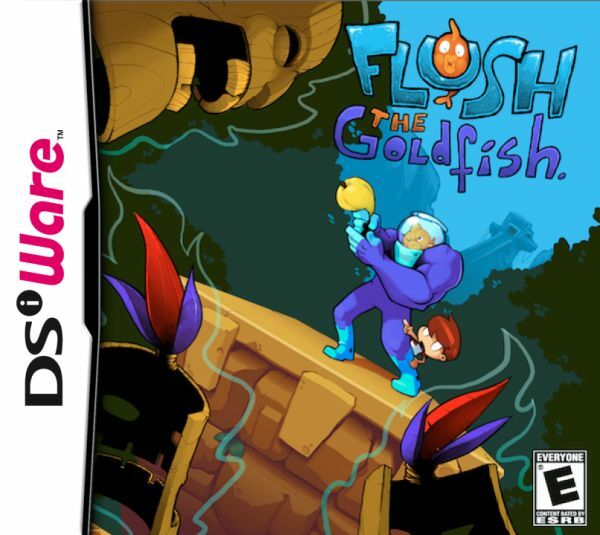 The main link to the first game can be found in the characters, though on this occasion the roles are reversed and Flush the goldfish is rescuing his kidnapped owner. Flush has a ‘super-secret robot suit’ to help him chase down and defeat an evil monster with a resemblance to Firebrand from Gargoyle’s Quest. It’s a premise both wacky and simple, setting the tone for the experience on offer. 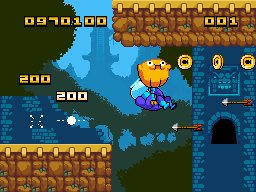 Flipper 2’s gameplay hook is a remarkably basic concept: all actions are executed with just one button. There’s no D-Pad or touch screen controls to be found — everything is done with the A button. Flush’s robotic suit moves through a number of single screen rooms, with the action button serving a different purpose in each area. It only takes a few seconds to go through a screen, with the button function quickly moving from ‘tap to run’ to ‘sidestep’ or ‘duck’, to name just a few. 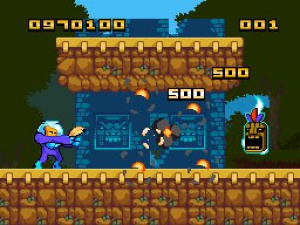 The puzzles in each room need to be navigated with good timing, often necessitating a few attempts: this quick-fire action has a similar vibe to a Wario Ware title, but with platforming thrown into the mix. The first mode that you’ll experience will be the Story Mode, completion of which will unlock extra features. This serves as a gradual learning exercise, with the difficulty increasing over its four levels. Each level has its own theme and is broken up into three sections of six screens each, with useful checkpoints thrown in. Lives are plentiful, and even when they’re all gone play resumes from the most recent checkpoint: it’s a generous system, but does mean that most gamers will be able to complete the story mode in under an hour. It may be short-lived, but the levels are well balanced and the gameplay compulsive: we’d also encourage our readers to patiently read all of the end credits as well, it’s worth it. Once the story is finished the Random Castle Mode is unlocked, which represents the majority of the title's replay value. This allows you to choose a difficulty level and theme and then random levels are generated which are variations of those in the story mode. This mode is ideal for short 15 minute bursts, as there appears to be a genuine diversity to the screens and puzzles, with the difficulty levels accommodating all players. There's the occasional screen that's overly frustrating, such as one that requires rapid tapping of the button to make Flush sprint. The speed required to make it across a moving platform is right at the edge of what’s feasible, and we found ourselves losing all of our lives repeatedly without being able to tap the button fast enough: a rare misstep, but frustrating when it occurs. Completing a round in this mode opens up the Editor, which allows you to create your own stages. In principle this is a nice idea, with simple tools that allow you to determine the assigned action on the screen, the structure of the platforms, placement of hazards and the inclusion of enemies. In practice it provides the gamer with the same creation tools as the developer, presented with a level of accessibility typical of the title. There are issues and major restrictions, however, which take the shine off this feature. Each level created is only a single screen — barely a few seconds of gameplay — and there's only enough space for three of these creations, with no way to share them with anyone else. There have been hints, even within the game, that this will be improved in a future update, but in its current form it’s only a curious diversion, rather than a fully-fledged level editor worth attention. The overall presentation of the title deserves praise. 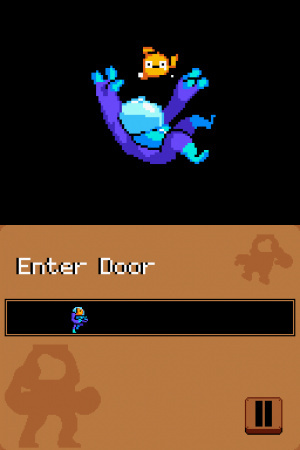 The graphics engine utilises some pleasant pixel art, with stages and environments often featuring nice touches, such as a sinister looking moon in the night sky. Small touches of humour are also present, with a variety of animations used depending on how Flush has met his end. There’s also some entertaining music to round things off, reinforcing the impression that this title was developed with a great deal of passion and care. Overall, Flipper 2: Flush the Goldfish provides a decent amount of content, albeit for bite-sized gaming sessions. The story mode is enjoyable in multiple playthroughs in pursuit of a higher score, particularly as the levels are well designed and balanced, while random castle mode is ideal for a quick burst of play. The level editor does feel like an afterthought, however, while the occasional frustrating level will agitate most. At 500 Nintendo Points it’s decent value, and an example of casual gaming that's also creative and full of charisma. I want it inside my 3DS. The two main gripes make me wish it could easily be updated. But this game looks / sounds quirky and good enough to justify a download. I think it could be a bigger hit for 200 NintendoPoints but maybe that's just my cheapa** me talking here. To be fair, the story mode acknowledges this and seems to skip to the next room after a few deaths. The random stage mode doesn't show the same mercy, so I just pray that these rooms don't appear. It's a fairly minor niggle in the grand scheme of things, and I can only speculate that the dev has lightning-fast thumbs. According to the development articles posted here earlier, the level editor was an afterthought. This one's going on my wishlist. While, 7 is a good score, I was expecting higher but I'll still get it at some point. the first one wasnt good so im not getting it. Really thought this would at least get an 8. Oh well, still getting it day one. I personally don't think the score should've been lowered by the level editor, considering it WAS an afterthought and the inclusion of it is fantastic as it is. I really believe that if the editor wasn't included or ever mentioned, this would get an 8 or 9, since besides the "occasional frustrating screen" that's the only negative part. "There have been hints, even within the game, that this will be improved in a future update, but in its current form it’s only a curious diversion, rather than a fully-fledged level editor worth attention." I thought DSiware wasn't allowed to have updates except for extreme circumstances. Am I wrong? Has Nintendo changed their policy? Perhaps that 200pts. dsiware game that Hugo Smits talked about IS the update (It's not completely unlikely as several dsiware titles released were basically expansion packs. DodoGo series and Pop Island to name two). WTF is with all the Earthworm Jim comments? This game may LOOK similar, but it takes a basic understanding of the game to realize it's not a rip-off of that. If you must, call it a rip-off of One Button Bob. Where's Hugo Smits when you need him ? I'd love to hear a word from him on the button-tap issue. the button-tap issue is a perfect example of me playing the game too much to notice it. It’s really not that hard; you have to do this at the right moment. I understand how this is hard for players that aren’t me, and I’m sorry for that! The level editor stuff; there was really no other way to do this. If I wanted to save more levels, I needed to reserve more space (means more blocks) which most players don’t like. Sharing is extremely difficult. Not so much the program but to get through lotcheck. Because basically the level code is ‘programming code’ that gets executed at runtime. Which means a smart hacker could inject his own program and run it without the Nintendo copy-protection noticing it! Rest assured; there will be a way to show/share your levels with others. I didn’t put the hint in there just to tease you guys and no, it will not be an update. I honestly also expected a 8, the 7 is good.. I just don’t really understand why not an 8 after reading the review (the only real bad thing he calls out are the running levels). @emiru69 depends on how many levels I would allow the player to save. The problem is that if I would allow for 10 levels to be saved I need to 'reserve' that space. Even if you don't actually edit 10 levels. I wish this was out in NA. Ive been waiting for it for ages! And thanks for addressing the button mashing section Hugo. Ill be sure I just carefully time it rather than jam A like crazy! Good review, and even though it sounds a little light on content, for being the $5 indie sequel to one of my favorite DSiWare games, my money is already secured. I just wanna know when it'll come out in America, darnit! Cute Title. I was expecting a bad review with a name like that, LOL! I had a goldfish once that finally got sick and it swam sideways for two whole weeks before I flushed it and put it out of it's misery. @ThomasBW84(8. ): Did you try the button-tapping segments again with HugoSmits (20. )’s hints in mind ? If so, did they help ? @battLeToaD @ThomasBW84: For people who really hate the level.. there's a bug in there to skip the level! when the platforms go down, just keep running. you will die, but your body will fall over the finish line thus skipping to the next level (you will lose 1 life though). @Eden concept are lying around... but I honestly don't know when the first one will hit the shop. The problem is that I have to start from scratch; build a totally new 3DS framework,etc to work from. So it will take up some time! Quickly beaten, then? 1 hour is a pretty short campaign mode, and 4 hours of stuff to beat overall isn't much. Of course if the game is high quality (which I don't doubt), and the levels are as replayable as in Flipper 1, then this will be a downloadable classic, which is why I'm still sold. @HugoSmits(29. ): Thanks again. I'm sure i will buy the game next time i visit the DSiShop. I guess that sequence just triggered a rare bad memory of DKCR in me. There's a part where shortly before the end of a level you have to stampede like crazy with Rhino. It took me a good handful of tries until i figured out how to do it. Hello all, I see there have been a couple of queries since I last looked at these comments so I'll try to answer them below. RE: the score - In terms of the seven, that was the score that I awarded, just to address any suggestion that the 'score doesn't match the text'. Every single review on the site is proofread by another member of the team before it goes live, and in this case the score was left alone. Personally, I don't award a score in terms of deducting points from 10 for individual faults, but use the scoring policy (linked at the bottom of every review) to reflect my overall opinion of the value/quality of a title; I try to be as objective as possible, of course. I thought 7, which is 'good' in our scale, felt right. It's all about opinions, and I fully respect all that have been expressed in these comments. In terms of the button tapping mechanic, I've just played the random mode for a while and, frustratingly, didn't get the screen with the moving platform where I kept dying. In other screens I tried timing the taps, but I don't think I've got the rhythm down. I can only write about how it happened for me, and when playing for the review I tried different approaches (fast, controlled, slow tapping) but obviously didn't find the right tempo that @HugoSmits referred to. As mentioned in my previous comment, it seems I found the glitch that allows progress in the story mode, I haven't seen the same glitch appear in random mode as yet. I can't wait to get this game. The graphics and animations look really sloppy, even for Game Boy Color standards... I can't imagine why anyone would praise this terrible sprite work in a review. And yes, the similarities between the main character and Earthworm Jim are quite obvious; the game's creator already admitted they took inspiration from the EWJ series. 7: "will sport a few areas where the game is blatantly let down to the detriment of its overall quality and enjoyment"
8: "Minor niggling factors or a badly judged difficulty spike may have made this game fall short"
I gave this game a 5 star rating at the e shop. I had a fun time playing it, it has a great old school feel to it, however I'm starting to regret my rating because I can't seem to understand how the scoring system works in the game. The better I do the worse I seem to score, the more I struggle to get through an area be it the story or random castle mode the better score I get. For example, 1st play through story mode took a while to get through and it was a struggle, 2nd play through finished much quicker with less button hits and deaths scored much less than my 1st play through. It just seems all over the place to me and the main reason to keep playing is to Beat your best score. I just don't get it???. Dose any one else notice this issue or could someone please explain to me how the scoring works? @Hugosmits. I'm I right to say that you need to die in areas where you score more and redo the same areas to get a higher score? The problem with random levels is that sometimes you have more coins/enemies than othertimes. Just like in zelda four swords (when you need to kill enemies for rupies). So that really has a big impact on your score! @HugoSmits thanx for responding it really is a great game, I play so many games these days and they get stale so quick and can't seen to hold my attention , your game brought me back to my child hood days when I first started playing games on the commodore 64. This is far from a earthworm Jim ripoff, it has a unique old school feel to it and worth every penny. looks like earthworm jim, but i cant wait to play! Either press A like crazy or press it at exactly the right times like Hugo said. I downloaded this today, and it's further proof that a simple idea is all you need. The art style and music remind me of a happier time in games, somewhere around the Amiga/Mega Drive era. A delightful little speed-run game. Thank you, @HugoSmits! A unique folowup to Flipper that I very much enjoyed. The score is fair, though I might give it an 8 myself (too bad NL doesnt do.5 increments ... a 7.5 seems just about right) Fun game, worth your time & money.